The legislation has produced one of the biggest surprises in Washington since Democrats swept the White House and Congress: The nation’s labor unions, which organized so effectively last year to help elect President Obama, have been outmaneuvered so far on their top priority by their opponents in the business community. ….Business groups […] started work well before the election and did not stop. 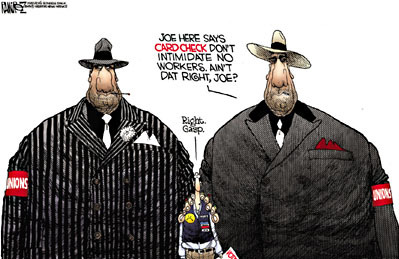 They feared that card check would lead to new unions and higher labor costs. Opponents included retailers, such as Bentonville, Ark.-based Wal-Mart, as well as restaurant chains, construction firms and hotels. More than 500 business and conservative organizations had formed the Coalition for a Democratic Workplace to coordinate an array of trade associations and other groups fighting card check….Half a dozen other groups backed by corporate, GOP or conservative ideological interests have also joined the fray. the allied business groups successfully cast the legislation as undemocratic: How could Congress oppose secret-ballot elections? The prospect of unionization rouses panic among Main Street conservatives more than any other single issue — more than taxes, more than deregulation — and whether James Dobson likes it or not, the GOP is a business party first and a social conservative party second. [From another post]: On a related note, here’s a prediction: Obama will need a few votes from Senate Republicans to pass his legislative program. I’ll bet he’ll get it on global warming controls, healthcare reform, economic stimulus, and financial regulation. But on EFCA, he’ll have trouble getting even a single Republican vote. That will be considered the make-or-break vote from the business community. Just wait and see. Not only would I not consider that an insightful observation, I’d say it’s downright banal. It was never impossible that card check might pass, but it was always the case that it was going to produce more energy, more solidarity, and more pressure on both Republicans and moderate Dems than any other legislation. Anyone who didn’t understand this on November 5th really has no business pretending they know anything about American politics.